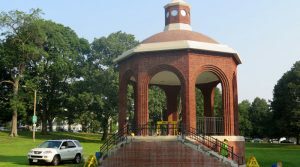 NER Construction Restores Historic South Boston Bandstand – NER Construction Management, Inc.
NER Construction is proud to have restored the historic bandstand in Marine Park in South Boston. NER worked to repair cracks in the mortar between the Bandstand’s bricks and to renew the exterior which has been exposed to the weather for over 80 years. The restored bandstand is set to be dedicated to and named for Harry Uhlman, a South Boston community activist who works with the South Boston Special Needs and Young Adults program. NER team members involved in the repointing and restoration of the bandstand are Roy Reis and Kyle Pinheir with Superintendent Tony Pereira and Project Manager Chris Saccone. To read the full article featured on South Boston Online, click here. NER Construction Management, Inc. has specialized in masonry restoration and waterproofing for over 35 years. To see some of our projects and to find out more about what we do, please visit our projects page.